Below the worktop is where I store my specialist card stock like double sided pearlescent, glitter, mirror and fancy printed card. I find it’s less likely to get damaged if kept in boxes (these were unwanted empty printer label boxes from a local school) This is also where I keep my 12″ x 12″ card and card stacks/pads. 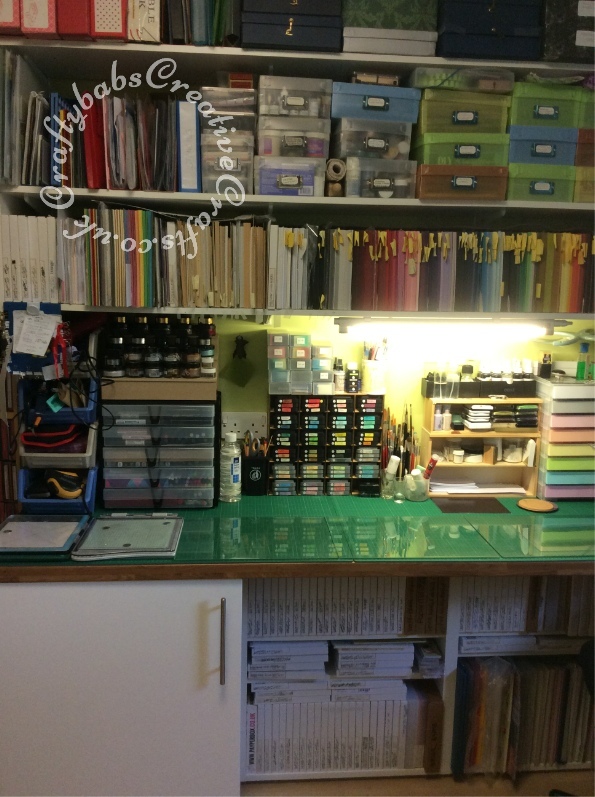 On the work top is where my Tim Holtz Distress and Distress Oxide pads live in their own unit. I numbered them all and keep a cut & dry pad for each colour in the clear boxes on top of the unit. Next to this is my Paint brush storage, close at hand and then some small wooden shelves housing my most used ink pads, refils, embossing powders, mica mists, Nuvo drops and a stack of paper offcuts for masking etc. On the shelf above the A4 card continues in colour groups. The second shelf holds more ink pads, embossing powders and loose glitters in the clear boxes. The coloured boxes house my ever-growing collection of stamps. The top shelf holds less used card kits and extra card.